Words | What The French?! So…um…like, yeah, well, you know, so anyway…and yeah…interesting blog post…and done. I’m sure there are all kinds of socio-linguistic reasons for filler words (that I’m inclined not to look up because…hey…Oscars are on tv, and who doesn’t love listening to ritualized thank you list recitation couched in a self-congratulatory three-to-four hour spectacle? ), but what intrigues me is how the inane repetition of unnecessary words (and some barely qualify as words) can bring you closer to “native” quality speech. And conversely, how one…euh…how you say…misuse of filler can make you sound foreign despite otherwise impeccable grammar and vocabulary. French 101 classes have been teaching “euh” (to replace the American “um”) and “bon ben” (kind of “ok…well”), “bof” (to express indifference “whatever”) and others for years now, but I think “du coup” flies under the radar of most American students and teachers. Go eavesdrop on some Parisians, however, and you’ll hear “du coup” punctuating the dead spots of stories with almost the same frequency that an American says “like” or “you know” or “so”. If you weren’t too distracted by the virtuoso use of steadycam (rivaling Birdman or Russian Ark), you may have noticed “du coup” and “alors du coup.” But what does it mean? Why are people suddenly using it so much? Should you start to say it? Can you even say it? He ends up with “Thus, I had never been interested in her.” ok…so…that…sounds…fluent. Yeah, “thus” . Just use “du coup” wherever you would use “thus”. bon bha moi j'y vais alors du coup, bn ! Some people might say that “du coup” is “suddenly” (like in “tout d’un coup”) or “consequently”, but the way it’s being used these days is more vague and less forceful, like “so…” Chances are, if you take “du coup” out of an average conversation, you won’t lose anything. Why are people suddenly using it so much? I don’t know. But a blog post by French pulp fiction/crime writer Claudine Chollet suggests that by 2006 it had reached epidemic status (her first sentence: L’expression “du coup” se propage actuellement comme un virus et contamine toutes les conversations.) Read the comments section of her post and you get the impression that it’s cyclical. An 80 year-old woman says that when she was young, she was taught that commoners used that expression. For 60 years, she claims, it disappeared, only to resurface and torment her again. Should you start to say it? Probably not. Mme Chollet calls “du coup” a form of intellectual manipulation—an impostor of “consequently” that presupposes your agreement with dubious logic. Yeah, but I don’t care about lexical morality, you say. Oh. In that case, it depends on your answer to the next question. Most anglophones have trouble with the “u” [y] and “ou” [u] in du coup—especially in such close proximity. If you have to make a conscious effort to say something that functions as an unconscious tick, maybe not. On the other hand, if you can say it three times fast with a great accent and an effortless sloppiness, then go for it. Spread the virus. You may have heard that the words “grammar” and “glamour”¹ share the same etymology², and that’s true. Based on the current meanings of the two words, and the images they bring to mind, the connection probably seems pretty far-fetched. 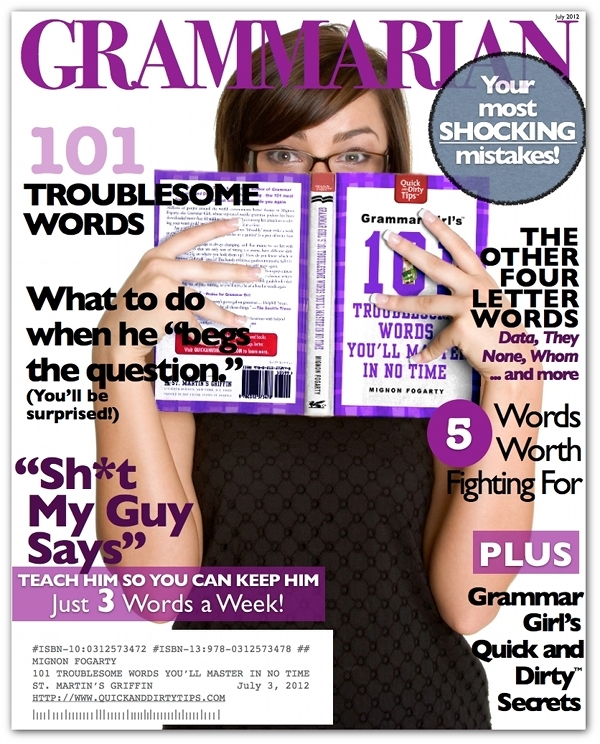 After all, there’s no glossy magazine of photoshopped people entitled Grammar. Well…a google search did bring this up. (Source site credits it to Mignon Fogarty). But back in the day, words and books were super cool. I swear it’s true. Owning a book meant you were probably super rich, and therefore better than other people, and maybe even a wizard. Seriously. Because what else are they going to put in books, besides gnarly magic spells for turning stuff into gold (for buying more books) and summoning dragons to devour your neighbors? So the humble word grammatica (Latin, from Greek ‘of letters’) became associated with books in general and then (by the kind of people who, with no access to actual books, came to the obvious conclusion that they were full of sweet magic) with a wizarding education. It entered English, like so many other words, via Old French. And from there? Well, to get to the word grammar as used in English today, it was just a matter of keeping the ‘education’ part and dropping the magic. To get to glamour, on the other hand, the magic stayed, but peoples’ idea of what magic is got changed around. Sadly, it no longer has connotations of the transmutation of base metals or reanimating the dead, and instead seems primarily focused on people trying to look photoshopped in real life. Grammar may be a tiring, boring, non-magical task for the modern student (whose books are still super expensive but confer no status whatsoever), but What The French?! can help. And if you, too, manage to make French grammar seem effortless and cool, people might just start to see you as a super attractive warlock. It could happen. “Casser les pieds à quelqu’un” (literally, to break someone’s feet) means to get on someone’s nerves, to annoy them. Have you anything subject to duty, Sir? Monsieur, avez-vous quelque chose à déclarer? Do you know what are the articles subject to duty? Savez-vous quels sont les articles soumis aux droits? Where is your luggage, if you please? Où est votre bagage, je vous prie. —Le voici dans ce coin. Very well, Sir, it will be examined presently. Très-bien, Monsieur, on l’examinera tout-à-l’heure. —Pourquoi pas tout de suite? Because there are other passengers before you. C’est qu’il y a d’autres voyageurs avant vous. —Will you keep me waiting long? I will attend to you in a few minutes. Je serai à vous dans quelques minutes. —That is right, I am going to open my trunk in the meantime. —Fort bien, je vais ouvrir ma malle en vous attendant. What have you in your trunk, Sir? Qu’avez-vous dans votre malle, Monsieur? —Clothing, a few books, and some small articles of no importance. —Des vêtements, quelques livres, et quelques menus articles sans importance. And what is there in that carpet bag, Sir? Et dans ce sac de nuit, Monsieur, qu’y a-t-il? —Du linge, des chaussures, etc. Very well, be kind enough to open it. I see that you have some cigars. Je vois que vous avez des cigares. —Yes, but only five or six. —Oui, mais seulement cinq ou six. —No, and you see I took care to put them on the top. —Non, et vous voyez j’ai eu soin de les mettre en-dessus. That is right, Sir. Now you can shut your trunk and your carpet bag, and have them carried away. Voilà qui est bien, Monsieur. Maintenant, vous pouvez fermer votre malle et votre sac de nuit, et les faire emporter. —Qui se chargera de cela? One of the porters that you see here. Un des commissionnaires que vous voyez ici. —How much shall I have to give him, if you please? —Combien aurai-je à lui donner, s’il vous plaît? Fifty centimes ought to satisfy him fully, I think. Cinquante centimes devront le satisfaire amplement, je pense. —Thanks for the information. Now I suppose that I may go. —Merci de ce renseignement. Maintenant je suppose que je puis partir. Yes, without a doubt; I have just marked your luggage to show that is has been examined. If you had had any duty to pay you would have been detained a few minutes. Oui, sans doute; je viens de marquer votre bagage pour faire voir qu’il a été visité. Si vous aviez eu des droits à payer, vous auriez été retenu quelques minutes. —I cannot shut my trunk. Would you help me, if you please? —Je ne peux pas ferma ma malle. Voudriez-vous m’aider, s’il vous plaît? —I see a disengaged carriage, that is what I want. —J’aperçois une voiture libre, voici mon affaire. Here’s a follow-up to last week’s wall of text. Hopefully it will be much easier to use. There’s even a site dedicated to nanars, complete with it’s own forum and a glossary to help you become a nanar savant. The verb cabotiner (to overact)doesn’t make it into French textbooks, but it comes in handy when discussing nanars. Learn more crucial nanar terms on Nanarland‘s site.